Senna 60 caps - To smoothen bowel movements and body slimming. 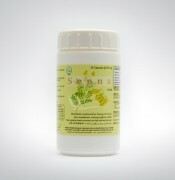 SENNA laxative effect caused by the active ingredient sennoside and active metabolism in the colon. Because of the constraints of water and electrolyte absorption from the intestine to increase the volume and pressure of the intestines.